wanting to earn their High School diploma in the afternoon and evening hours. 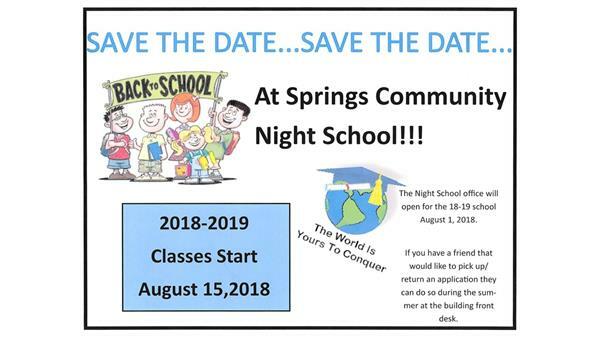 Springs Community Night School offers a safe, rigorous academic environment that empowers students to be productive, successful, lifelong learners through positive partnerships. Go to class ONLY FOUR AFTERNOON/EVENINGS a week, Monday-Thursday. Traditional classroom and online classes available. Low student to teacher ratios. Afternoon and Evening hours: 1:30-9:48pm. Credit earning potential of 12 to 18 credits per year (minimum for full-time students). Credit recovery option for students wanting to continue enrollment at a traditional high school during the day. All students will experience academic success at SCNS. All students need an opportunity to learn in an encouraging environment that fosters engagement and growth. The power of collaboration between school, staff, home, community and the students will achieve our program mission. In holding all students responsible for their individual success. In the worth of each student, and that every student deserves to be treated with dignity and respect. In students performing at academic levels which meet or exceed state proficiency standards. In providing a rigorous curriculum that prepares students for life choices they make. We are excited to tell you about a brand new set of communication tools the District and all schools will be using next school year to better communicate with our families, staff and the community. We will begin using the Blackboard suite of communication tools including new district and school websites that will be mobile adaptive, a new custom branded mobile app with parent/guardian alert and notification features, and a new mass notification tool that will allow for faster communication from our school to your inbox, mobile device and phone. Look for new notifications and websites starting in August! on days when class is not in session.